New York (TADIAS) – Nina Ashenafi Richardson, an Ethiopian-American judge, who was elected to the Leon County bench in Florida on November 4th, 2008, is hard at work in the Sunshine State’s capital county. She recently told the Tallahassee Democrat that although her workload is heavy, she is mindful of the responsibilities and privileges of her new position. Born in Ethiopia, Nina came to the U.S. as a young girl and was raised by her late father Professor Ashenafi Kebede, the renowned Ethiopian composer and musicologist, who was the Founder and first Director of the National Saint Yared School of Music in Ethiopia. In the United States, he taught Ethnomusicology and served as the Director of the Center for African-American Culture at Florida State University, where his daughter later earned her law degree. He was also the Director of the Ethiopian Research Council, comprised of Ethiopian and American academics and professionals, which was founded by African American scholar Leo Hansberry. Judge Nina, a mother of two, who is married to former State Legislator Curtis Richardson, was also the the first African-American woman to head the Tallahassee Bar Association and the first African-American to lead the Tallahassee Women Lawyers (TWL). Tadias congratulates Judge Nina Ashenafi Richardson on her accomplishments! husband Curtis B. Richardson, and daughters on Friday, January 30, 2009. Big ups for this sister. Congratulations!!!!!! Her father was a truly gifted person and his daughters are his legacy. Congratulations and your election announces to the Diaspora and beyond that Ethiopian Americans have arrived, they are here to stay and they are part and parcel of the American fabric. This is a wonderful news. Judge Nina Ashenafi Richardson, my deep respect to you and good luck! An exciting time for all of us, Ethiopians both at home and abroad, for we witnessed Nina as the first Ethiopian American judge. We already have Obama as the first African-American U.S president. Subsequent developments have also demonstrated the addition of a number of African-American new officials in the new administration. I know the story of professor Ashenafi from a compilation I made along with a friend musician a few years ago. At a time when I am waiting for the publication of my co-produced voluminous work it is indeed pleasant to hear such a good news. On behalf of my family, I wish judge Nina a very successful career on the Bench. Congratulations!!!! This has to be the beginning of the Road, and of course it is. We all are proud of you. The father was outstandingly great, and the daughter became the same as the father. We expect the same from Nina Ashenafi’s daughters. It will not be a big surprise if they become the next Barak Obama. What a great accomplishment dear sister. You are such a great role model for our beloved sisters and little daughters. Hope we all tell our kids judge Nina’s story. Only the sky is the limit. Congratulations Nina and the family, congratulations Ethiopian Americans. I am very proud like other Ethiopians. She is someone with authority and style that people can look up to. It is a new way of looking in the 21st century. Keep it up sis. May god bless u and ur family. This is another big step in our life time. Congratulations, you are one of the women and men of Ethiopian origin who could make us feel happy and proud. Keep on moving, I hope you will be able to reach still a better position in that free society. Congratulations Judge Richardson from a fellow Floridian and African immigrant. You are an inspiration not only to Africans, but also to women everywhere. Keep on doing what you’re doing my sis. I can just imagine your father smiling in heaven. I enjoyed reading about him as well. Even though I am from the the West Coast of Africa and you were born in Ethiopia, which is located on the East Coast of Africa, your father reminds me of my own father, who is also a scholar and professor. The similarity lies in their quiet yet dignified face. Your Honor, once again most deserved congratulations and good luck! Congratulations Judge Richardson. I am proud of you. This is a good news for immigrants. Congratulations for becoming the first judge in the first Ethiopian-American generation and wish you great success in your judicial role. Your dad was an inspiring choir instructor in which I participated as a student in Teferi Mekonnen H/S. He was a man of excellence, a consummate intellectual and a highly dedicated musician. I am happy to see, but not surprised, for him to have raised such a successful daughter who made a breakthrough just like he did. He was one and only and it appears that you are a rare and a precious a legacy who inspires our sisters and daughters. May god be with you as you serve those who come for justice. Congratulations! She is a good example for our sisters! God bless you. Congratulation your honor!, you are noble pride not only for your husband, daughters and the whole other family, but also for the entire hard working black girls and women in the world, especially for those who have big dreams like you and struggle with school work and other jobs tirelessly to advance. My daughter, who came from Ethiopia 2yr’s ago has got a great role model and thank you for being that person. Congratulations Sister! Great achievement Nina. We are proud of you and this should be encouraging for all of us in Diaspora. Congratulation you are good example of habesha. Yeah…. I am from New Orleans, La, and I love Ethiopian people, they are some of the nicest people in the World. I am not surprised at all, the daughter of Ashenafi Kebede became a judge. Being Ashenafi’s daughter, it will not be surprising if she makes it to the Supreme Court. He was a genius. Follow his path. I am so proud of you judge ashenafi do a very good job and god be with you. Dear Nina, I am proud of you. I hope this will inspire a lot of people around the world. This gives a good message for all immigrant that everything is possible. I wish you success in your office and keep up the good job. Like so many Ethiopians here in USA, I would like to say ENEQUAN DES ALISH ! You are indeed a great role model to so many Ethiopians ! Keep the hard Work and wish you the best of luck ! I am very proud and happy to hear such a great news! Wishing you all the best!! CHEERS!! We continue to make history & re-write the pages they have stolen from our legacy. Thank you Nina Ashenafi Richardson for helping to push forward our dreams and goals to yet another level of excellence. May God continue to bless you & your entire family and may you deliver justice at it’s highest degree with regal grace. Congradulations judge Nina Ashenafi Richardson, all of us here in Ethiopia are so proud of you. I would have liked to say a lot about your dad too, but this is your achievement and the limelight is all yours! Rastafari goodness and mercy be with us! From Down Under, Melbourne Australia. I congratulate you and may God bless you and your family for the remarkable achievement. Way to go your Honor! You makes proud. Congratulation Nina Asenafi! 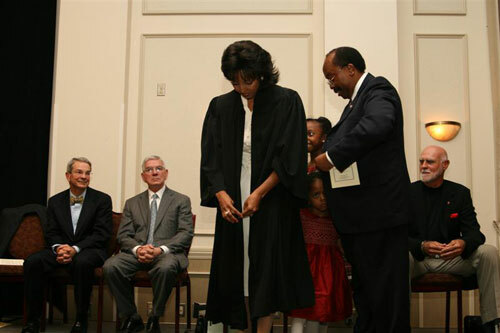 I am proud as an Ethiopian to see a female judge in the court of United States of America. Congrats to Nina and to the start of a new beginning to Ethiopian-Americans. I hope that many others take this new road and thrive; may it be God’s wil. Your achievement is such a monumental inspiration for many strong goal-oiented beautiful Ethiopian women. You made all the sisters proud of you. With all due respect, I would like to congratulate you as you begin your new chapter of life, The Honorable Judge Nina Ashenaffi Richardson. Indeed you win, (ASHENEFISH) through persistence and determination. Once again, you underlined remarkably the undenaiable beauty, strenght and power of Ethiopian Women. Congratulation Nina Asenafi! I am proud of you. Congratulations your honor.You are great and you are an inspiration for all of us females in Ethiopia.I am sure this is not the end of the road for you and you will wake us up with some more news again. This is beautiful to hear! Congratulations!!! You make us all proud!!! You are good example to all women. Wow Nina, you really changed our profile to higher level. Thanks girl! Let God gives you the Grace in all your doings. Congra to Ethiopians all over! Congratulation and may God blees you and the USA. BTW, I sang in your father’s glee club choir at Tafari Makonnen High School! whole other family, but also for the entire Habesha people. May God bless you. This is from London, England. My aunt (W/O Almaz Yilma) has been looking for you for a long time. Your father’s mother (grandmother) and her father are brother and sister. She will be happy to contact you as she has great respect and love for your father. If you want to contact her please send an e-mail to Kukusha@hotmail.co.uk. Congradulation My black sister job well done.you can achieve your goal only in America.Yes we can!! Congradulation,Judge Nina Ashenafi Richardson,you are one of the Ethiopian-American inspirational and role model for all young Ethiopian-American who are seeking success,God bless you. Your Honor! My entire family is sooo proud of you!!! I am an ETHIOPIAN women raised by exceptional ETHIOPIAN fathers like yours. Let’s not forget that it is our ETHIOPIAN heritage that makes us successful. Thank you for promoting positive image for Ethiopian Women! Congratulation !! to Judge Nina, Mr. Richardson, little ones (your daughters.) My appreciation, especially to Mr. Richardson in being supportive husband in giving her time, encouragement and energy she needed. Congradulations NIna, We, here in Addis, heard the news and are so proud of you. Your father, may God rest his soul in perfect peace, should know that he is one of the luckiest Ethiopians. Hope he was here to see what you achieved. May God repay you by showing you your children’s success. May God bless you, and help you in this. Congradulations Judge Nina Ashenafi. You represent women of color as a whole and Ethiopian women in particular. It is our landmark, we claim this event. We have come a long way! Congradulations dearest sister. Hooray, Judge Nina. I am so proud of you and a great role model to my 10 and 8 years old daughters. Professor Ashenafi was my Music Mentor at Tafari Makonnen High School in Ethiopia. Congratulations. I have no words to describe it how much I get proud when I hear my home boys and girls move up here in the US. This is a great achievement and you are a role model for immigrants who have the potential and work hard to reach their dreams. keep up the good work. I thank God for you, Judge Nina Ashenafi Richardson! With all due respect,your honor,congradulations and GOD bless you and your family. I am a big fan of Professor Ashenafi Kebede. When I heard about his young girl’s achievement, I’m proud a lot..
Dear Nina, I would like to say congratulation! I wish you a very good success! Many congraulations to you and all yours. As much as I am proud of your achievement and what you can give to the US, it is my prayer that God will give you wisdom as well as favour so that you would feel fulfilled at the end of each day. What a wonderful example for Ethiopians and all black women around the world. Congratulations, my sister! What a wonderful news! I am so proud of you Judge Nina. You are a very good role model for many other Ethiopian-Americans. We hope and expect that you will do even much better than what you have accomplished now. I will keep you in my prayer. May The Almighty GOD be with you, Dr. Ashenafi and your lovely mom, and of course the rest of the family. it comes up with responsibility.and i hope you will do a good job. i am proud of you and inspired by you. congragulations again. and may God bless you. Judge Nina, What a great honor for all Ethiopians. Let God be with you and your family always. What a proud for all of us. We look up to you and God bless all your way long. Yes!!! News like this makes me so happy!! Ethiopians are going somewhere in this country and it’s only the beginning…in the future, we will see more and more intelligent and distinguished brothers and sisters. Proud of her and every other Habesha working towards a positive struggle. Our deepest congratulations!!! We really proud of you and you’re a true living example for many Ethiopian’s. All the very best in your every day life!! Wishing you one day to be able to go to the Supreme Court or even better to replace Chief Justice John G. Roberts! Congrats Judge Nina! As an Ethio-American myself, very proud of your achievement. One thing is sure, you are a judge in this wonderful nation, the United States of America, and as such you will not be harassed,pressured or swayed by authorities and other political forces one way or the other. Every morning you wake up, it will be in good conscious, to judge the fate of ‘alleged’ criminals based on your education professional ethics/judgment and last but not least the LAW OF THE LAND. Now, your fellow Ethiopian judges, such as Judge Birtukan Mideksa, are not as lucky as you are just because they are judges in Ethiopia. I’m wondering when that will change and a judge is a judge no matter where. Let me conclude my note with one open ended question: Now, what are you able to do, based on your profession and profession as a judge to the cause of th Ethiopian judges? Very, Very, Very Proud of this accomplishment, Mom and Dad must have done a good job. Just keep the ball rolling. Big Smile on everybody’s face. Congratulation! Proud for all of us. I am proud of you like all the other Ethiopians. Keep up the good work and let them know that we also have a beautiful and educated ladies in Ethiopia and all over the world. You are a celebrity keep up the good work. Dr. Ashenafi was a great man, Like father and like daughter. God Bless You. Congratulations! I am proud of you! God bless all your ways. You are the mirror of reflection for many of us. You are an inspiration to all of us. Motivator in your accomplishment. Thank you for all your sacrifices to get here. My daughter and I are proud of you. Congrats Nina, I thank the Almighty God that He gives us lots of talents like you. I heard a lot about your father. He was a good model for fathers. You made us all proud. Stay blessed. Congratulation Judge Nina A. Richardson! You deserve the honor and you do have self-evident, uncontested capacity to undertake such a high responsibility. Odaa (Your great dad’s ex-student and ex-neighbor in the city of origin, Finfinnee (Shaggar/Addis Ababa). I am proud of you. Congratulations! You are an inspiration to all of us. You are a Hero woman like Obama! Congratulations! Do not for get Birtukan Medikesa and teddy afro. You are a pride to all Ethiopians. This will be a real encouragement to every Ethiopian in diaspora. Let we all cheer in her name& wish her a very successful endavor through out her career. Let God Bless us all!!! i hope you will influence and support your people with your knowledge and experience. I am so proud of you Nina. You are really an Ethiopian. How wonderful! proud of you. Where is Mrs. Ashenafi, the mother of Nina Ashenafi in this story. The woman who elected and chose her culture, her nationality and Ethiopia, but forgotten. That is the woman I am more proud of. We are proud of u like we are of your father. Don’t forget your poor country Ethiopia. Judge Nina you inspire me as an African American woman of partial Ethiopian (Oromo) descent. I have passed your legacy down to my Ethiopian goddaughters. Also, what a wonderful family and father figure you have! Reply to “henok” – you have nooooo idea what you are talking about…. …you should be proud of ALL women “Henok”! Congratulations to Judge Nina! This is a great encouragement and inspiration to ALL women indeed! I am proud of you. I am young lawyer in Ethiopia and your success inspires me. I appreciate you! I am so pround of you. I have no words to express my feeling! I did not know that you are the daughter of the renowned Ethiopian composer and musicologist, professor Ashenafi Kebede. I wish he were there! God bless you!!!! !